MK Dons will host AFC Wimbledon, who were set up by Wimbledon FC fans in the wake of the club's move to Milton Keynes, in round one of the League Cup. It is only the second time the two sides will have met since AFC Wimbledon were formed in 2002. Conference Premier play-off winners Cambridge United travel to Championship side Birmingham City and fellow League Two new boys Luton host Swindon. All ties will be played in the week commencing 11 August. Cardiff, who finished bottom of the Premier League last season, face a trip to Coventry, but former top-flight sides Fulham and Norwich have been given byes. They will start in the second round along with Premier League sides that are not competing in Europe. 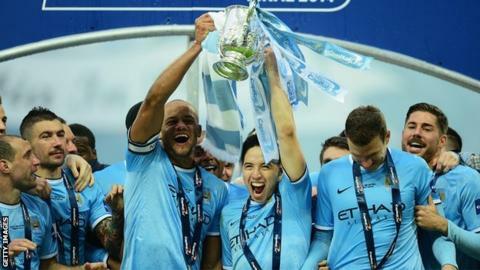 The seven teams that will join in the competition from round three are holders Manchester City, Liverpool, Chelsea and Arsenal, who have qualified for the Champions League, and Everton, Tottenham and Hull, who will be representing England in the Europa League. Four-times winners Nottingham Forest travel to Tranmere in round one, while League One champions Wolves host Northampton Town, who avoided relegation from the Football League on the last day of the season. It will be the third time in four years that Wolves have met the Cobblers in the competition. However, the round's main talking point is likely to be provided by the meeting of MK Dons and AFC Wimbledon, who first came face to face in the second round of the FA Cup in 2012, a game the League One Dons won 2-1. Wimbledon FC relocated 56 miles to Milton Keynes in 2003 after the plan was approved by the Football Association and were subsequently renamed MK Dons the following year. AFC Wimbledon won promotion to the Football League in 2011, nine years after being formed by supporters of the original club.